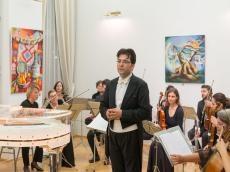 A grand concert of the Vienna Chamber Orchestra and a solo exhibition of works by famous artist, member of Artists Union of Azerbaijan Nargiz Guliyeva has been organized in Azerbaijan Cultural Center in Vienna. The gala concert was timed to the 25th anniversary of the establishment of diplomatic relations between Azerbaijan and Austria, Trend Life reported. Speakers at the event included the Azerbaijani Ambassador to Austria Ghalib Israfilov, director of the Azerbaijan Cultural Center Leyla Gasymova and the member of the Austrian Parliament, the head of the Azerbaijan-Austria interparliamentary friendship group Georg Vettel. The speakers stressed the rapid development of relations between the two countries. The event was followed by a concert of the Vienna Chamber Orchestra, conducted by Azerbaijan's Honored Artist, Eyyub Guliyev. The best examples of Azerbaijani and Western classical music, including works by Uzeyir Hajibeyli, Gara Garaev, Fikret Amirov, Niyazi, Vagif Mustafazade, Muslim Magomayev, Wolfgang Amadeus Mozart, Johann Strauss, Franz Lehar, Edward Grieg, Georges Bizet and others pleased the audience. The concert was also attended by laureates of international competitions - pianist Abuzer Manafzade and Aytaj Shihalizade (mezzo-soprano), who this year successfully entered the Vienna University of Music and Fine Arts. The performance of Azerbaijani and Austrian musicians caused admiration from the public. Further, guests enjoyed personal exhibition of the talented artist Nargiz Guliyeva. The art lovers were presented 12 new works by a young artist, dedicated to Azerbaijani history, culture and art.